The Louis Dreyfus Armateurs Group is evolving. We are organized into three business divisions offering great career opportunities in logistics & transport, dry bulk and marine industrial solutions, on land or at sea. Our 2,600 shore-based and ship-based personnel located around the world are our wealth and our pride by their training, their careers, their personalities, their visions of the world and their cultural diversities. We are proud to share with you today a series of interviews of our team members. 1/ Could you give us a brief summary of your background and tell us more about your current position? After a scientific French baccalaureate and two years studying medicine, I joined the ENMM (National School of Merchant Navy) in Le Havre in 1998 for the first three years of my training, during which I was a student at SNCM, Delmas and Broström Tankers. I was hired in 2002 as an officer at Louis Dreyfus Armateurs and joined the company again at the end of my fifth year at the ENMM in Marseille in 2003. I am now the Captain of the MARION DUFRESNE, a research and supply vessel operating for the French Southern and Antarctic Lands. I feel proud and honoured to have been entrusted with the captaincy of such a legendary ship, which we were introduced to only a year ago. This role is extremely rewarding given the vessel’s many operations (refueling, passenger transport, scientific research…) and the opportunity to manage a crew with various experiences, coming from all types of LDA vessels. 2 / What has your career path been like at Louis Dreyfus Armateurs? 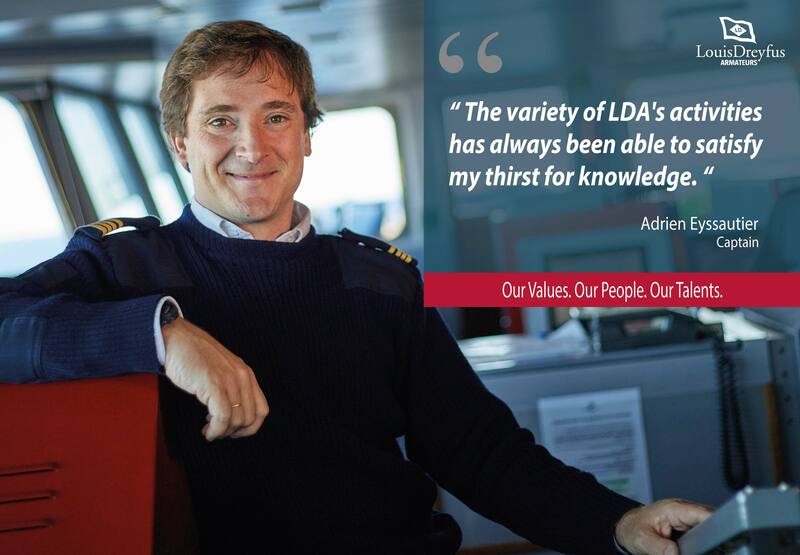 I started my sailing experience at LDA as a multi-tasking officer on bulk carriers, working alternately as an engineer or a lieutenant. I then embarked on the EDOUARD LD as a lieutenant and I have not left the deck since then. Later on, I went to work with seismic research vessels as a Second Captain. I went back and forth between bulk carriers and seismic research vessels before I joined the S / V PRINCESS, then the OCEANIC CHALLENGER as a Captain, until the end of our partnership with CGG. I was called back to the head office to work for our Information desk, in order to help and give advice to the crew members affected by the termination of the seismic activity. I was then appointed as Deputy Port Captain. I took to the sea again onboard the cable ship ILE DE BATZ to learn more about an activity that I was not familiar with yet. I was then sent to the MARION DUFRESNE as Captain. 3 / Which aspects do you find most stimulating in your job with LDA ? The variety of LDA's activities has always been able to satisfy my thirst for knowledge. Beyond a maritime aspect, I can see the ability of the Louis Dreyfus Armateurs Group and its seagoing and onshore personnel to constantly diversify, adapt, seek and provide solutions to problems, and getting better along the way.